Tablet Weaving also called card weaving is a weaving technique where tablets or cards are used to create a gap, called a shed, through which a weft thread is passed. The technique is limited to narrow bands which can be used for belts, straps, or garment trims. The origins of this technique go back at least to the early Iron age. Examples have been found at Hochdorf in Germany and at Apremont in France. Tablet-woven bands are commonly found in Iron age graves and are presumed to be standard trim for garments among various peoples, including the Vikings. Tablets are now normally made from card but in the past they have been made form bark,wood, bone, horn,stones, leather and metal. Some weavers even drill holes in a set of playing cards as an easy way to get customized tablets or large numbers of inexpensive tablets. The tablets are usually marked with colors or stripes so that their facings and orientations can be easily seen. Side view of tablet weaving in progress. The cards can be any shape. The fundamental principle is to turn the tablets to lift selected sets of threads in the warp. The tablets may be turned in one direction continually as a pack, turned individually to create patterns, or turned some number of times "forward" and the same number "back". Twisting the tablets in only one direction can create a ribbon that curls in the direction of the twist, though there are ways to thread the tablets that mitigate this issue. Traditionally, one end of the warp was tucked into, or wrapped around the weaver's belt, and the other was looped over a toe, or tied to a pole or furniture. Some traditional weavers weave between two poles, and wrap the weft around the poles. Information on 6-hole tablet weaving can be found on the Tablet Weavers' International Studies and Techniques (TWIST) organisation website: www.tabletweavers.org/B.Datta_monograph.php. Bonita (Bonnie) Datta prepared the monograph based on her teaching notes. Bonnie is no longer tablet weaving but in January 2016 she added further images and drafts for 128 patterns and has kindly given permission for the work to be shared freely. Her generosity in so doing is gratefully acknowledged by the Braid Society and will be appreciated by many tablet weavers. Tablet Weaving also called card weaving i is a weaving technique where tablets or cards are used to create a gap, called a shed, through which a weft thread is passed. The technique is limited to narrow bands which can be used for belts, straps, or garment trim. The origins of this technique go back at least to the early Iron age.Examples have been found at Hochdorf in Germany and at Apremont in France. . Tablet-woven bands are commonly found in Iron age graves and are presumed to be standard trim for garments among various peoples, including the Vikings. 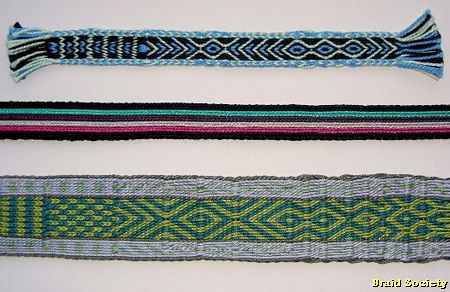 Below is a gallery of bands made by members of the Braid Society by tablet weaving. Click on an image to see more information about the materials and method etc.